Merlot. A selection of Rosso Gravner produced only in the best years. Fermented on the skins in open vats for five weeks with wild yeasts and no temperature control. Aged in oak barrel for seven years and subsequently in bottles for another seven years. Bottled during a waning moon without fining nor filtration. No-till farming x Moon x Skin contact x Amphorae x Long ageing. Josko Gravner is known as an innovator who drastically changed wine-making in Oslavia(in Friuli-Venezia Giulia, Northern part of Italy) and its “orange wine” movement has spread to all over the world. Among all the iconic Italian natural wine producers(like Dario Princic, Paolo Vodopivec, Angiolino Maule), Gravner and Radikon are deified. Gravner is also only person who is acknowledged by Gianfranco Soldera, as a great white wine producer. His family had produced ordinary table wines and sold to others. When he took over the estate from his father, he as enthusiastic enough and he began to implement many new technologies. He was one of the first producer who bought stainless tank in this area and he produced clean and crispy wines from Chardonnay, Sauvignon, Pinot Griggio and so on. And then, he began to use barriques and tried to model after “Burgundy” with his neighbours such as Stanko Radikon, and changed to large wooden vats, and they tried maceration(skin contact) for white wine too. In the vineyards, he began to devote natural cultivation(especially Masanobu Fukuoka) and he reached to No-till farming(Nontillage cultivation). On the way of quest, they encountered Georgian wine and it impressed them strongly. They desired to visit Georgia, but Georgia had belonged to Soviet Union at that time, so it was not easy to visit Georgia. Soviet Union collapsed in 1991, but civil war continued in Georgia, therefore Josko Gravner could not approach Georgia yet. And then, he could step into Georgia in May 2000 finally. Georgia has long history of wine-making since 8000 B.C., and it has been produced by Qvevri(Amphora. Large clay pot) buried underground. 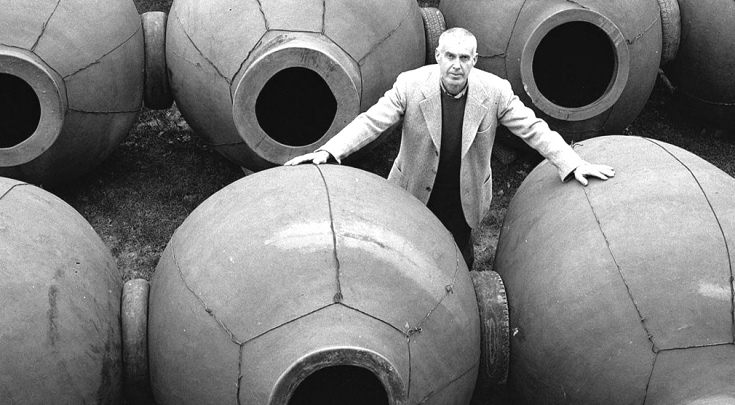 When Josko Gravner back to Oslavia, he cleaned up all the equipment and buried Amphorae underground, then he produced first "Amphorae wine" in 2001. The white wines are made from Ribolla(as a sigle variety wine) and Chardonnay, Sauvignon, Pinot Grigio and Riesling Italico(these four are blended). While fermenting in Georgian amphorae buried underground, it underwent a long maceration with grape skin(so called skin contact), with wild yeasts and no temperature control. After the drawing off and pressing phases the wine was poured back into amphorae for at least five more months before it started ageing in large oak barrels, where it was left for six years. Wine is bottled during waning moon, without fining nor filtration.